I’ve already spoken about syglino or pasto which is cured pork meat which is smoked. However, after the meat is cured and smoked it has to be cooked and preserved in olive oil. This is an old method which they used when there were no refrigerators but it is still used as it adds flavour to the cured meat. If this meat was produced anywhere else than Greece and promoted properly be sure that it would be considered as one of the most gourmet meats. When my son went to Sparta a few weeks before Easter I called him the day before he was leaving to remind him to bring some pasto and sausages, which we love. I told him to bring about a kilo of meat and 1/2 kilo sausages but when we were talking on the phone one of our relatives heard our conversation so next day he went and bought some to send us without mentioning it to my son. I couldn’t believe my eyes when I saw all this meat. In the meantime, my son bought some as well and this would be enough for at least six months as it’s not something we eat every day but mostly as an appetizer with other mezedes. As if this was not enough he sent us some red wine he made which was fantastic and other relatives sent us a big container of olive oil (about 20 litres), which of course is always welcome and look at all these oranges!!! I did not weigh them but they should be at least 15 kilos. There were at least three kinds and Merlin are my favourite. Those were kept to be eaten and the rest we made juice to drink and I used a lot to make desserts but also in savory recipes. Jelly, with fresh orange juice, Kataifi with orange cream, Karaoli with orange cream (cream horns), salmon, chicken, potatoes, glyko portokali (orange preserve) etc. Back to the post for pasto again. I had to cook all that meat but had to cook it in two batches as I didn’t have a saucepan which was big enough to take all that meat. I’ve cooked it before only this time I made my own twist and added some orange juice in this recipe as well and it was perfect. I cannot describe how delicious this meat is but this is definitely something you should try when you come to Greece. Heat the olive oil and saute the meat. Add the wine and wait a few minutes for the alcohol to evaporate. Add all the remaining ingredients and if necessary add some water to cover the meat. Bring to boil and simmer until the meat is cooked. Remove all the visible fat from the meat and place in sterilized jars. Fill the jars with olive oil to cover meat. I am posting below a few dishes I have prepared with pasto: Omelette with mushrooms and pasto, kagianas with pasto (just like the other recipe with kagianas and tomatoes but I added pasto as well), Pasto Kagianas (scrumbled eggs with pasto), farfalle with pasto and a recipe which will be posted soon, Fakes me Kritharaki and Pasto (lentils with orzo and pasto). Kagianas with pasto is very easy. You cut the meat into small pieces. In a frying pan heat a couple of tablespoons olive oil, from the one the pasto is preserved in. Saute the meat for a couple of minutes. Add a few eggs (depending on the quantity) add some salt and freshly ground pepper. Add it to the meat and using a spatula mix until the eggs are cooked. Together with a salad with you a quick, easy and delicious meal!! In a sautéing pan heat the olive oil and sauté the onions. Add the mushrooms and sauté for about five minutes.Add the peppers and sauté for 1 minute. Season with salt and pepper, add pasto and oregano and mix. When done transfer half mixture to a smaller non-stick frying pan. In a separate bowl beat three eggs for each omelette and pour on top of the mushrooms. Keep lifting the frying pan above the heat until the egg starts to set.Slide into a plate and then invert into the frying pan for a couple of minutes until the omelette is done on both sides. Cook pasta in salty water, according to package instructions, al dente. In a skillet heat the olive oil and sauté the onion, until translucent. Add the smoked meat and sauté for a couple of minutes. Drain pasta and add it in the skillet. Add the cream and season with salt and pepper. Kritharaki me Fakes and Pasto (Orzo with lentils and pasto) will be posted separately soon. Eventhough I am going to bed, I could definitely eat that kind of food right now ;-P! ivy,only good things!and omelettes is so good,i know,we made it in this way!not so healthy but delicious! Isn't ot nice to receive parcels like that? I love smoked ham. Both dishes you cooked look delicious. See what happens when you get flooded by the generosity of relatives? You are going to have to cook day and night to use these up! At least, we also get to benefit! The smoked pork sounds amazing and the omelette with it looks totally scrumptious! I need to try this for sure! In my father's family they would store pork meat in big jars of olive oil, fresh sausages and chops. They didn't smoke any of the cured meat. 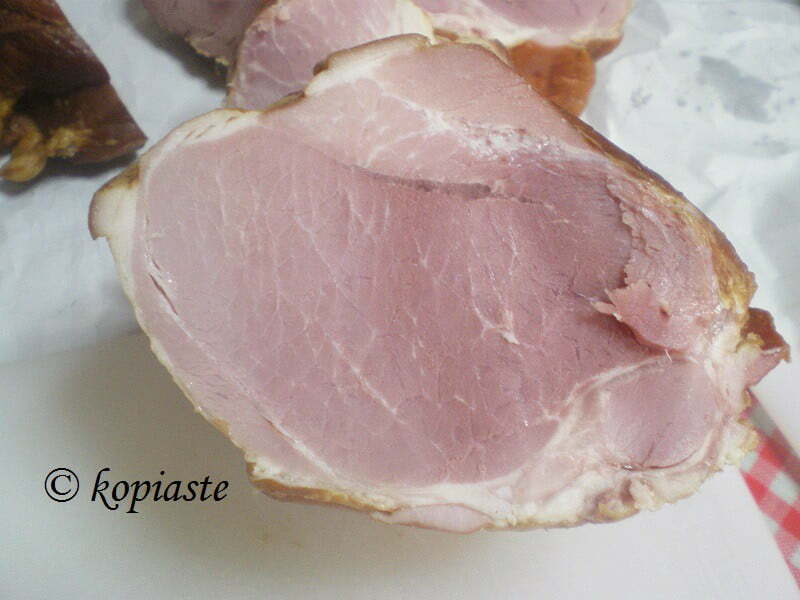 It was when I visited Croatia that I first tasted lightly smoked cured meat, like prosciutto: it was excellent. I would certainly like to taste some pasto. What a nice gift! The orange juice in the oil and wine mixture sounds great, and the omelette and orzo look delicious. Woohoo – look at all that fabulous meat! You are a lucky gal. And of ocurse, your omelette looks delicious. Love the orange creation! Omelette would be just perfect for my breakfast now!